Expansion! Sounds like a huge word that describes something that is going to be massive in nature. Well, we serve a God who is massive and is always looking for ways to expand the Kingdom! One of those ways is through more equipment being donated every week. We often say, "We will soon need a bigger warehouse!" and that is exactly what is happening! Just this past week we were blessed with over 950 football helmets, 300+ shoulder pads, along with jerseys, pants and pads. 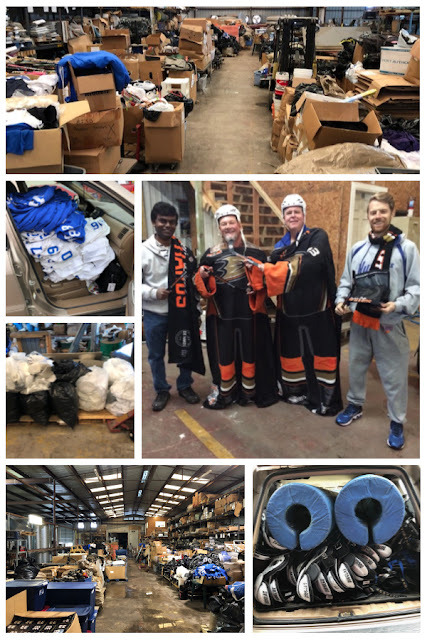 We were also blessed with a huge shipment of pallets full of hockey donations from the Aerodrome Houston facility and the Anaheim Ducks organization in California! We also received a call from Dallas to pick up thousands of football pants, jerseys and pads. God is formulating great marriages with other ministries and we are excited to be walking alongside Fellowship of Christian Athletes and now Sports Reach! God is going above and beyond, and the donated equipment is opening doors to share His love. It is such a blessing and we are giving Him all the glory and honor! HE DID IT! He is just allowing us to be a part of it. Let's Do IT! 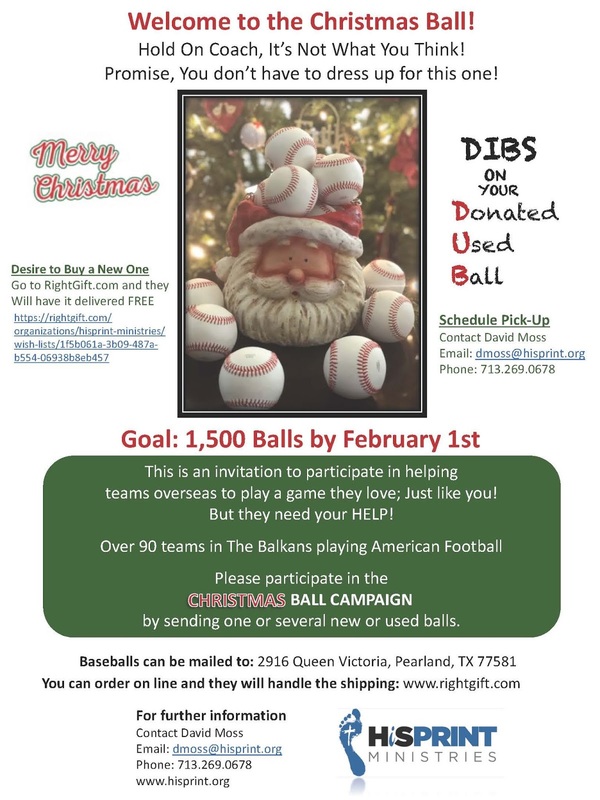 We are currently doing a "Christmas Ball" drive to raise awareness of our need for used and/or new baseballs and footballs to distribute across the Globe. 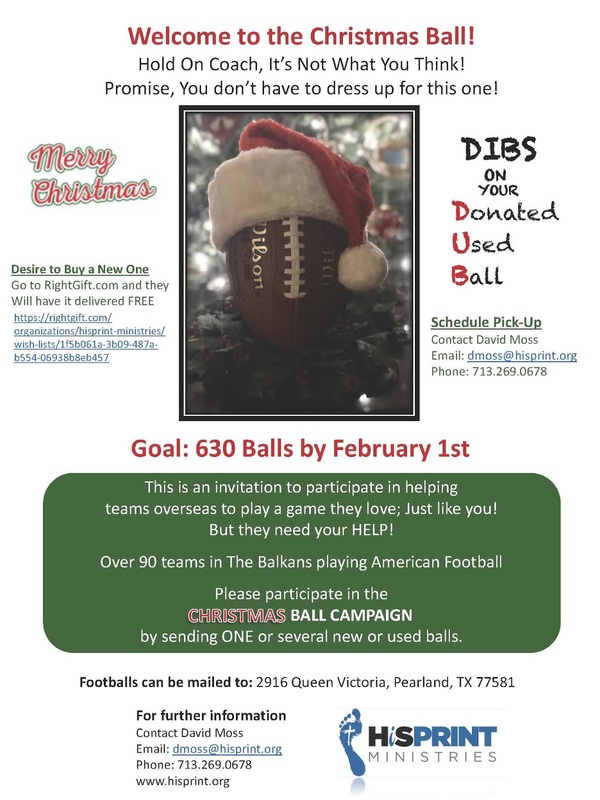 We are calling it "Dibs on your DUBS" (Donated Used Balls) and are asking schools, teams, churches and individuals to join us in getting more balls to meet the weekly requests we receive from around the globe! For those who would like to donate new balls, we have partnered with Right Gift to connect donors directly with national retailers. Balls purchased through this program will be shipped directly to HiS PRINT Ministries. God bless each of you and let's all remember that HE DID IT! John 3:16 - He chose the nails in our place so that we could have victory over sin and death; so Let's Do IT! 1 John 3:16 - This is how we know what love is, Christ died for us, let us do the same for our brothers and sisters. Thank you for blessing us through this past year and as we press into 2019, please keep us in your prayers; my precious bride and I will be going into HiS PRINT full time! The ministry is growing and needs more and more attention. As a result I will be leaving The Gathering of Men and the ministry & blessing of financial support I have received from them. The Gathering of Men has blessed us immensely by providing a generous gift to show their support! Please keep Roger Wernette, Executive Director of The Gathering, in your prayers and the wonderful ministry they do at reaching men in the work place and helping them see Jesus, reflect Jesus and lead like Jesus!